The new Apple TV is here, but what about Apple's TV? Will we see the Apple TV launch this year? When Apple released the original iPhone and kicked off the current smartphone revolution, several companies started worrying. One was Kodak, who realized the days of the point-and-shoot were numbered. Sony, Olympus and others saw a dark shadow grow over the voice recorder market and their pocket video cam business. And, with its built-in GPS chip and navigation apps, Garmin and TomTom had reason to get nervous. Now, with rumbles of an Apple iTV in the works, there's a whole new reason to sweat. But why should we worry? The iTV may be an all-in-one appliance for the living room that does just about everything, taking the capabilities of the new Apple TV a stage further. Any company that makes a streaming media device (Roku), set-top box (Motorola or Logitech), home video conferencing (Cisco), and even a casual game console (Nintendo) should take note. Here are the features we want most in the rumored television, and why you will probably buy one. The TiVo proved that one-click recording was possible, but we want something more. We don't want to wait, ever. With enough agreements in place, there's no reason the iTV can't offer immediate one-click access to any show. The lack of this functionality is what is letting down Google TV. Say you know that Person of Interest is starting at 8. Today, you can set your DVR to record the show and watch it live or on a later date. But what if you forget to record it? What if the show is delayed? With the Apple TV set-top box, you can buy the show and download it, but that takes time. A killer feature on the iTV would be immediate streaming for any show. You'd open the BBC "channel" and watch the latest episodes, whether they are four days old, four weeks or four years. Current catch-up TV and IPTV offers video-on-demand, but there is a delay between when the content aired and when it is available. Of course, with iTV, we'll probably have to pay for the privilege. Touch control might seem cool – it's the so-called Angry Birds advantage. 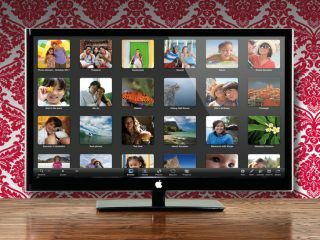 And, to some extent, swiping on a 42-inch display sounds fun. But television is best as a lean-back experience. Samsung already offers gesture control on their Smart TV, and Haier is developing gesture controls for TV. Many other companies offer gesture control, including Microsoft with the Kinect, but we expect something amazing from Apple: detailed recognition. Swiping through channels with your hand is one thing, but more complex gestures might be holding up a few digits to make commands, having the iTV sense your facial expression and suggest similarly entertaining shows, and even sensing your mood. Now that Siri on the iPhone 4S paved the way to better speech recognition (even if she can't read you a simple email), the iTV should be similarly equipped. But we want advanced voice functionality. We should be able to just say the name of a TV show to start watching the latest episode. More importantly, the iTV should become a primary home appliance. Walk in a room, and you could say "Google search latest showtimes" or "Book my flight to Chicago" and Siri on iTV would get to work. As a bonus, Siri should know who is talking, understand your history of commands, and even offer suggestions. "John, do you want me to read your email while you watch Doctor Who again?" Yes. Siri should also understand complex statements, instructing her to archive a few four-star science fiction movies, anything starring Naomi Watts before 2002, and all Manchester United games from a particular season. Of course, the iTV should be remarkably well integrated with the iPhone. Apple has not done a great job in this regard so far. The HBO Go app does a better job tracking what you have watched recently, for example. When you use the app on your phone to watch a movie, and then access the site form your computer, you can pick up right where you left off – watching Game of Thrones for example. Apple products should be more self-aware than this – offering to continue playing the same Coldplay song you were listening to in the car on your iPhone, or suggesting you finish the next level of Ninja Fruit (using gestures, of course). The Apple iTV's bigger screen will usher in a new age of entertainment – seeing a map showing where you need to go on a business trip, letting you book the tickets or even keeping track of the clothes you need to bring along. We want to be able to play a first-person shooter as though we're on an Xbox 360, but then switch quickly over to Microsoft Word and speak an entire document. In other words: the iTV should combine everything that is good about a Mac, an iPhone, and the Apple TV. Oh, and if Best Buy is the US did post the iTV listing by mistake and the product costs under $1500 (£956), that's a good thing too.